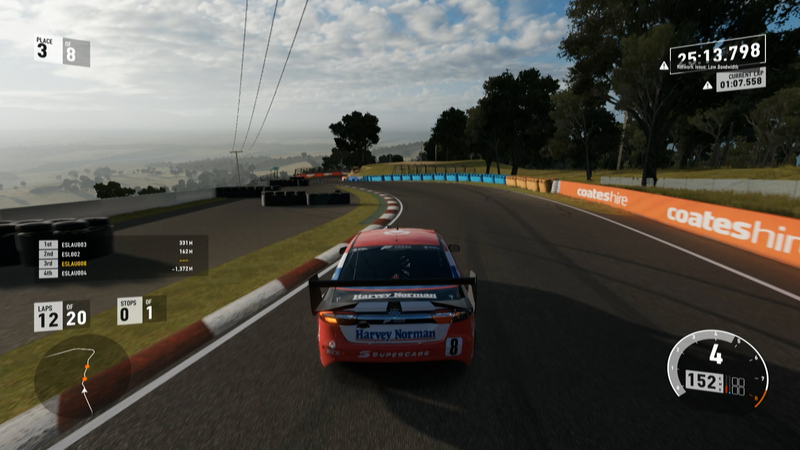 Andrew Dyson dominated the first day of the Harvey Norman Supercars Forza Challenge, winning all three esports races at Bathurst. The eight finalists contested a 10-lap race at Laguna Sega in Ford FG X Falcons, a five-lapper at Spa-Francorchamps in Holden VF Commodores and a 10-lap encounter at Brands Hatch in Nissan Altimas. That followed the esports specialists teaming up with Supercars drivers for an All Stars race on Wednesday evening, won by Scott McLaughlin and John Burrows. Making an excellent start, Dyson took the lead early in Race 1 ahead of Adrian Yalpi, Burrows and Matthew Gater, before the latter two tangled, allowing Jarrod Lamprey up to third. Lamprey set about pursuing Yalpi, eventually moving into second with a pass at Laguna Seca’s famous Corkscrew. The second race at Spa had a multi-car collision at the first corner with Yalpi coming off worst and falling to the back of the field. Gater capitalised on the mayhem and moved up to third, while the shenanigans allowed Dyson to pull well clear in the lead as Lamprey resisted pressure from Gater to again finish second. Excellent starts from both Dyson and Lamprey allowed them to pull to an early Race 3 lead, with Matthew Bink this time moving up to third spot ahead of Burrows and Jacob Harvey. An ill-fated overtaking move at the end of the eighth lap resulted in Bink and Burrows running off the circuit, elevating Harvey to third at the chequered flag behind Dyson and Lamprey. “It’s been an excellent day and a big confidence booster, but there’s still a long way to go,” Dyson said. “In Race 1, I was lucky at the start – a gap presented itself and I was able to make the move into the lead. “The last few laps were pretty nerve-wracking because I could see Jarrod catching up and I made a few mistakes. Lampey sits second in the points after the first day of racing, with Harvey third. “In Race 1 I had good pace, but Race 2 I wasn’t as fast as Andrew because I didn’t have any experience at Spa,” Lamprey said. Six more races on Friday and Saturday will set the grid for the Grand Final on Saturday evening, which will be broadcast live on Supercars.com.